Hikey970 is Super Edge AI Computing Platform Powered by Kirin970 SOC with 4 x Cortex A73,4 x Cortex A53. 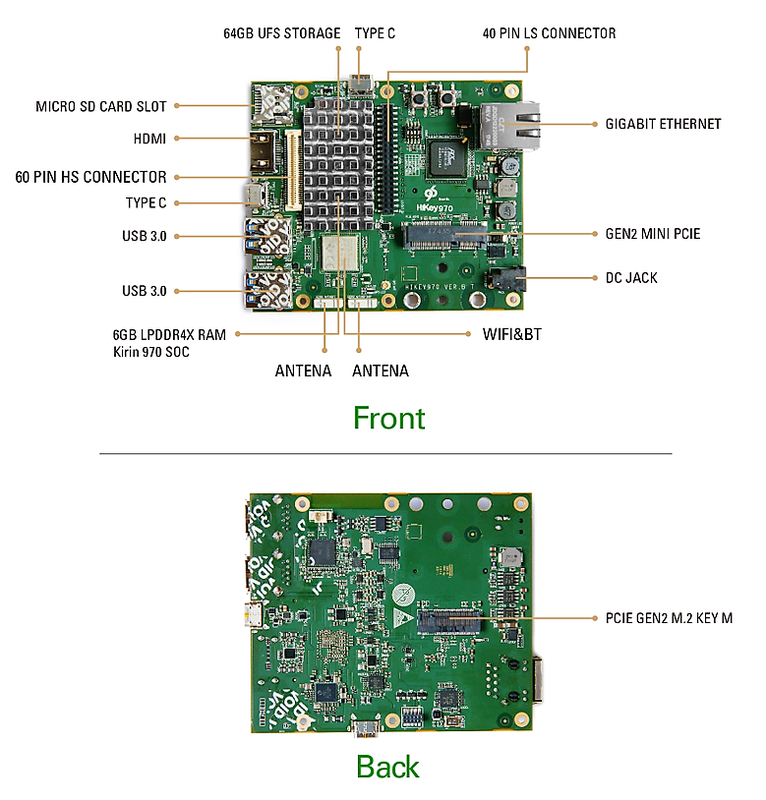 Hikey970 has 6GB LPDDR4 RAM, 64GB UFS storage, Gigabit Ethernet, GPS,PCIE Gen2 and CAN on board. As world’s first dedicated NPU AI platform, Hikey970 integrates Huawei HiAI computing architecture and popular neural network frameworks which supports CPU, GPU AI and Neural Processing Unit dedicated to AI acceleration. Also It also comes with Huawei’s HiAI SDK. Hikey 970 can be used in most application in build Deep Learning, Robots, Automobile and Smart City. Which Deep Learning frameworks are supported by this board? Why GLONASS but no Beidou? Do you have the support to program the Tensilica Vision P6 DSP available as part of HiKey 970? Hi there, sorry, we do not have the bandwidth to support this. thanks.